LA’s Known Gallery present new solo shows by Patrick Martinez and Aaron De La Cruz, running concurrently from June 16th. 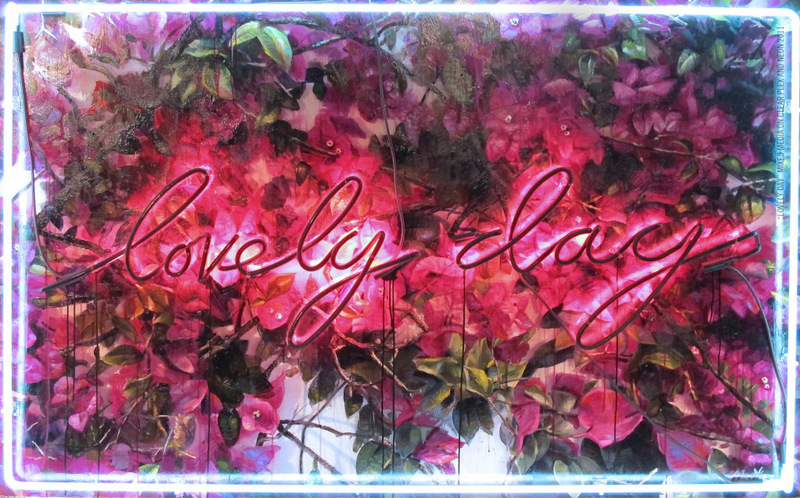 Known for his lush colorful paintings and portraits set in the Los Angeles streets, his neon works that play on hip-hop themes, his sculptures and his limited-edition objects, Patrick’s exhibition, Lovely Day, revisits the Los Angeles landscape. “It’s crazy to me that I wake up to beautiful days here in L.A., but they are juxtaposed with the ‘evil’ things that happen in this sublime city. That’s the inspiration for the show,” says Martinez. Staying true to the show’s title, Some Thing Else, De La Cruz pushes his own personal boundaries with a diverse and multifaceted exhibition. Much as his crisp lines weave throughout his individual works like strings through fabric, the aesthetic elements of his unique voice find themselves manifested in a variety of mediums while remaining a cohesive and compelling whole. Furthering the artist’s amalgamation of art and design, Some Thing Else will also feature the debut of De La Cruz’s accessory line and custom crafted jewelry.